It may sound like a strange thing to say about such a legendary photographer, but Ansel Adams is something of a controversial figure among curators of my generation. People still love his work, but as the professional field has increasingly come to embrace a harder-edged, more conceptual brand of photography, Adams has lost some of his critical appeal. This is especially true in landscape, in which New Topographics and the so-called Dusseldorf school have held sway for decades. I love that work, but I’m interested in things that others overlook, and I’ve always felt Ansel was more interesting than people give him credit for. After all, this was a man whose career extended for almost sixty years, whose work is among the best known on the planet, and an active educator who had a direct influence on hundreds, possibly thousands of photographers. He was also a Modern Artist who had a distinct and reasoned position in the history of photographic art. This is what makes the subject of water in Ansel’s art exciting to me. Especially in the 1920s and 30s (people forget how early the work was), he was already making sharp-focus, complex formal compositions composed in the camera – the best of his work easily rivals that of his friends Edward Weston and Imogen Cunningham. 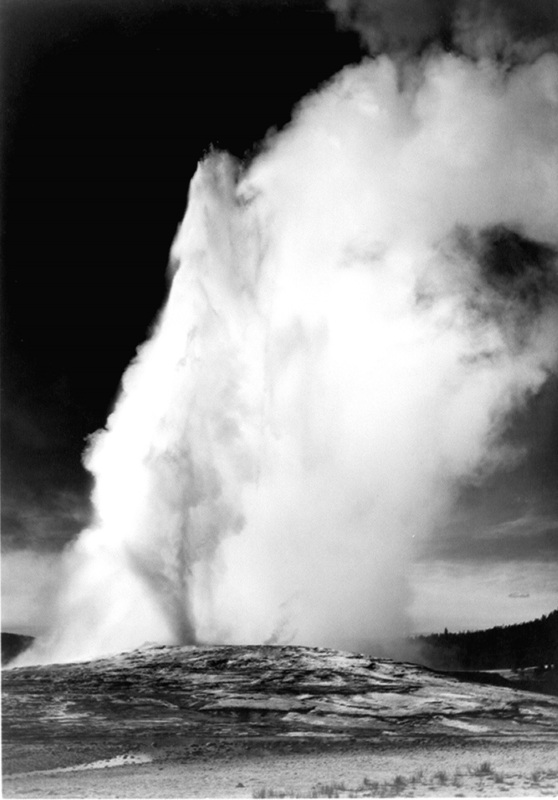 However, while most (but by no means all) photographic modernists made pictures of carefully selected stationary scenes and objects (think Weston’s Pepper #30), Adams photographed shifting, evanescent things like waterfalls, sea spray, storms, rapids, and geysers. Some of these things he couldn’t even see with his naked eye. Of course, he knew he was setting up to photograph, say, a waterfall. But the exact shape of it – its thunderous ebb, flow and texture, was impossible to anticipate. So in that way, every shot was a revelation. When he made this kind of picture, Adams didn’t really know what he had until he developed the film. This reflects an attitude to the omniscience of camera and lens that is quite Modern. And when he combined this with repeated views of the same or similar things – his famous Surf Sequence, for example, or his repeated views of Old Faithful erupting – he tapped into ideas about seriality and sequence that even the most conceptual contemporary artists can appreciate. I’ve been contemplating these things as I work to refine the checklist for Ansel Adams: At the Water’s Edge, which will open at the Peabody Essex Museum in summer of 2012. What I’ve been finding in my visits to places like the Center for Creative Photography at the University of Arizona (above), where Adams’s archive is housed, is that pictures of motion and time are not so much the exception but the rule with Adams. Hi, I made a special trip from Scotland to London to see the Ansel Adams exhibition at the Maritime museum there and i was stunned by the quality of the work. I have read his three most famous books on the camera, the negative and the print (several times so i could understand) and of course i have ssen prints reproduced in magazines and books. none of that prepared me for some of the prints presented at the exhibition which I found simply overwhelming in terms of their technical brilliance and evidence of the creation of the image in the mind first. Many of the images stand the test of time and can be regarded as current despite some of the more up to date photographers such as Klein but naturally some of them are a little dated in concept. In fact I found it difficult to understand why some of the more prosaic shots were even made as they provide little in terms of artistic truth and are simply records of a scene. Nothing wrong with that but I was not sure why they were chosen. Having said that the overall impression was one of great satisfaction and respect for Adams and an almost overwhelming desire to raise my level of technical and artistic endeavour in order to say what I want to say through photography. Many thanks for that experience. Very good of you Robin, I very much appreciate your kind words and am glad your trip to London did not disappoint.